Europa's 100th book, and it's a doozy! Both Jenn and Stephanie are fans -- Hottest Dishes features a narrator you'll love to hate. Sharply comic with a twist of Soviet realism. Did you know Grover Cleveland secretly had surgery for cancer on a boat? Us neither. File under: things you never realized you didn't know (but totally need to) about U.S. history. We do love us some Regency romance. Here are three of our new favorites, guaranteed to please (ahem). You can also catch all three ladies at WORD tonight, Wednesday April 27th! With glowing endorsements from staff favorites Charles Yu and Alan Heathcock, we can't imagine passing this one up. Plus, have you noticed how perfect short stories are for the subway? What have all your favorite fairy-tale characters been up to? 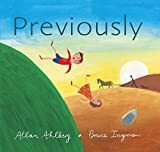 Catch up with them in this fun new picture book, which instead of "Once upon a time" starts every story with "Previously..."